Boomerang's Studied Approach: After interviewing countless developers, architects, engineers, contractors and parking consultants, we found that existing automated parking solutions were not adequately addressing market concerns of throughput, redundancy, fire & life safely, and serviceability. We are confident that if you compare our revolutionary patent pending solutions, you will find that we excel in each of these key areas. Please contact Boomerang directly for any project related questions. 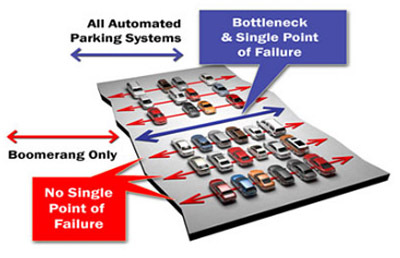 Automated Parking systems allow vehicles to be stored without human intervention and allow for much greater vehicle density within a parking facility. Because they are about twice as efficient as a typical self park ramp garage, automated parking facilities consume substantially less space, preserving more room for street level retail or open space to make for a more attractive development. * Elimination of Carbon Emissions since cars are turned off once in the garage. 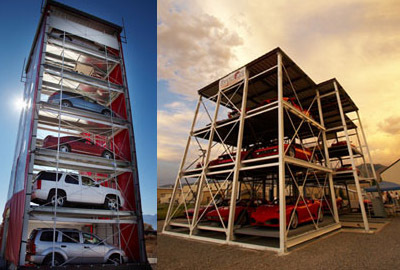 * Half the materials are used in the construction of the garage. * Less electricity required due to reduced lighting and ventilation requirements. * Preferential parking automatically granted to electric and hybrid vehicles.